The Australian-owned Russian Travel Centre has been booking travellers on river cruises in Russia since 1987 and has seen cruising emerge as one of the most popular ways of exploring Russia. This specialised team travels extensively to provide you with first-hand knowledge and expertise. There is no easier way to explore Russia than through its ancient waterways on a relaxing river cruise. You pack and unpack only once and have no need to worry about early morning starts. Travel between Moscow and St Petersburg to experience life in the riverside towns and rural settlements. Or venture south to the lower Volga, visiting magical places like Nizhny Novgorod, Samara, Saratov and Volgograd. 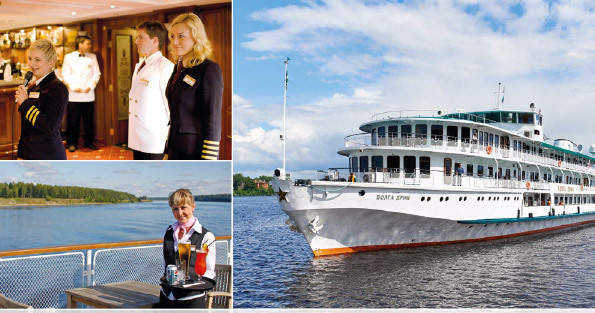 The family owned and operated MS Volga Dream is a first class, boutique ship offering an intimate cruising experience. With just 109 guests and 60 attentive staff, you will cruise in style and comfort, feeling spoilt every step of the way. With elegant cabins, gourmet dining and a friendly, hand-picked crew, this luxury vessel is a perfect choice for your Russia visit. The cruise between Moscow and St Petersburg has a unique feature that will enhance your experience in many ways. You spend three nights in centrally located 5-star hotels in both Moscow and St Petersburg, located a few minutes' walking distance from the main sights. This allows you to make the most of your time in these two amazing cities. With other cruise companies, you stay on the ship moored on the city's outskirts, requiring lengthy transfers each day and restricting your opportunities for independent sightseeing. That's the Volga Dream difference. People who ordered Russia Luxury Cruise Tours also ordered the free travel brochures below. Click on the images to find out more about these brochures.